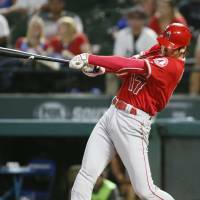 ARLINGTON, TEXAS - Shohei Ohtani homered twice on a huge night at the plate after getting bad news about his pitching arm, and the Los Angeles Angels beat the Texas Rangers 9-3 on Wednesday. 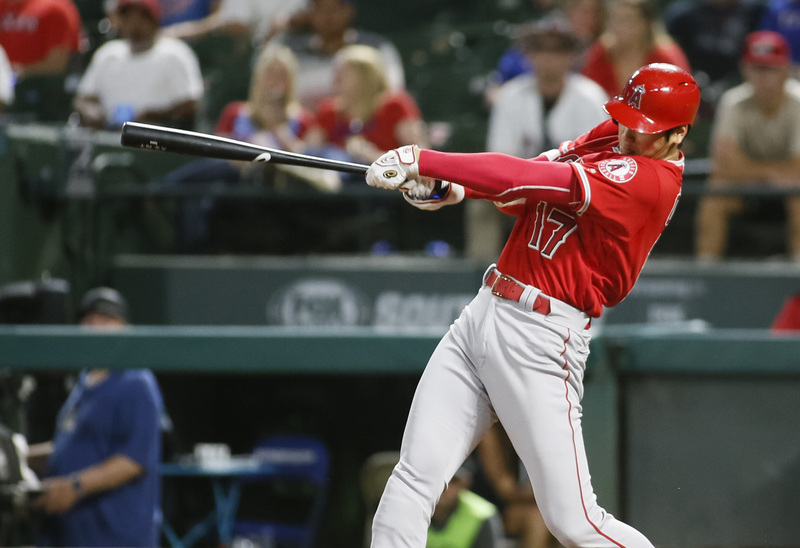 Perhaps headed for Tommy John surgery, the two-way rookie sensation went 4-for-4 with three RBIs, four runs and a stolen base to power the Angels. About two hours before the game, the team announced Ohtani has new damage in his right elbow and ligament-replacement surgery has been recommended. The club said the star had an MRI earlier in the day that revealed the problem in his ulnar collateral ligament. Ohtani’s homers were towering drives into the right-field seats. With his second two-homer game, the designated hitter tied Kenji Johjima’s 2006 major league record of 18 homers by a Japanese rookie. Adrian Beltre hit a two-run shot for Texas, the 472nd homer of his career, in the sixth inning against Jim Johnson. Three of Beltre’s 10 homers this season have come in the last five games. Ohtani didn’t speak with reporters following the game. Ohtani lasted only 2⅓ innings in that start against the Astros, and he had a drastic drop in velocity during the game. He had been scheduled to throw a light bullpen session Wednesday, but never did after reporting that his elbow was sore. The medical staff then decided that he should get the new MRI in Texas. “I’m sure at some point he’s going to resume his pitching career,” Scioscia said. “When that is depends on whatever the course of action is. In 10 starts on the mound, the right-hander was 4-2 with a 3.31 ERA. He struck out 63 with 22 walks in 51⅔ innings.